Yes, Day of the Dead is just around the corner, and we wouldn’t want to your body to rot waiting for all the otherworldly details about Mexico’s most beloved holiday. Throughout Mexico, the holiday is known as Día de los Muertos, or Day of the Dead. In Yucatan, however, the holiday is known by the name used by the Yucatec Maya of the region: Hanal Pixan. 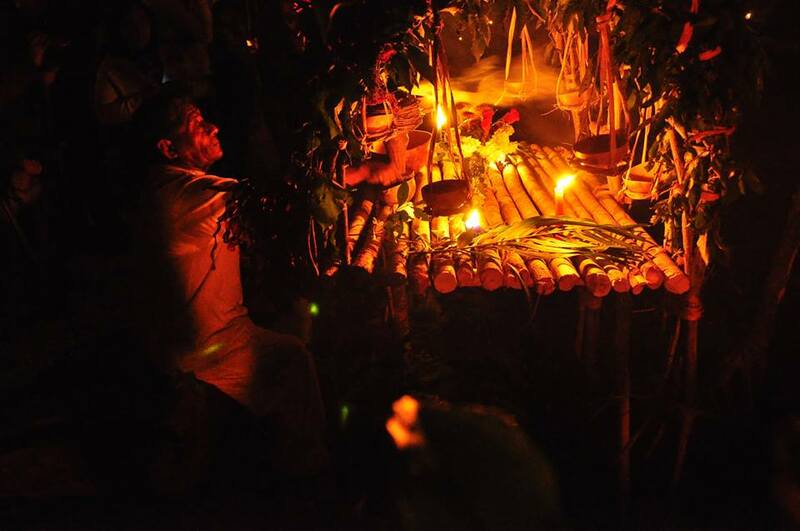 Depending on the event and where you are, you can experience the magic of these special celebrations of life and death from the last week of October up until November 2nd. Note: we’ve update the article on October 16 with more details on events in Cancun, Cozumel, and Playa del Carmen. In this article, we’re going to break down Day of the Dead and then tell you what you all about the who, what, when, and where of what you can expect. 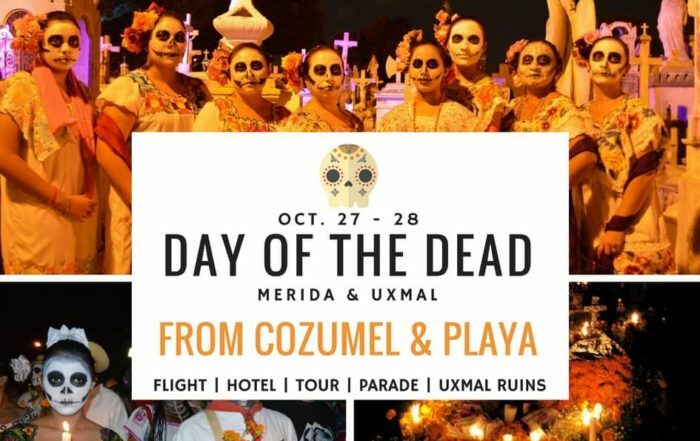 As an extra bonus, at Fly Cozumel we’re offering a special Day of the Dead tour to Merida including participation in the town’s world-famous Paseo de las ánimas (Passage of the Souls) on October 27, 2017. What is the difference between Day of the Dead and Hanal Pixan? Well, for starters, Halloween it ain’t. Day of the Dead is an ancient pre-Hispanic tradition which has been practiced for thousands of years. Day of the Dead in Mexico is celebrated each year on November 1st and November 2nd. November 1st is considered Día de los inocentes or Day of the Innocent, and is considered a time to remember and received the infants and children who have continued their journey to Mictlán. Some also refer to the date as Día de los angelitos or Day of the Little Angles. November 2nd is the official Día de los muertos or Día de los difuntos, a day to celebrate, remember, and interact with the deceased loved ones who made it past childhood. In the beginning, going back around 3,000 years, the Day of the Dead traditions were mostly celebrated in Mesoamerica in the area now known as southern Mexico as well as parts of Central America. The indigenous nations of northern Mexico did not practice these beliefs until they became more widespread throughout the country in the second half of the 20th century. Today, Day of the Dead celebrations can be found throughout the world, especially where Mexican or other Latin American immigrant communities can be found. This refers to a cooking technique common to the region known as “Pib” in which food is cooked in a natural underground oven. It works like this: a hole is dug in the ground while rocks are cooked in a fire. Once ready, the rocks are placed into the pit and the pieces of Mucbilpollo, which are similar to tamales, are wrapped in banana leaves and placed into the hole over the rocks. The food is then covered back up and allowed to cook for at least one hour. There are many elements which as essential to a Day of the Dead celebration. Some, such as the Catrina, are recognized throughout the world. Others, such as the Mucbilpollo, are not so well-known. Here’s a list of some of the more representative items you will find during Day of the Dead or Hanal Pixan. No Day of the Dead Celebration would be complete without one. It would almost be like celebrating Christmas without a Christmas tree or Hanukkah without the menorah. They are the basis for which everything else falls into place. It would be like celebrating Christmas without a Christmas tree or Hanukkah without the menorah. They are the basis for which everything else falls into place. Day of the Dead altars are the basis for which everything else falls into place. Calaveras or sugar skulls are another important element you’ll find each year come Day of the Dead. The tradition of making candy skulls actually came from the Spaniard’s skill at turning sugar into shapes. These sweet skulls make look tasty, however, they are for decoration purposes only. Luckily, these amazing creations have nothing to do with the Katrina that wrought so much destruction on Louisiana. In fact, the modern-day Catrinas are the product of Jose Guadalupe Posadas, a talented Mexican artist who lived in around the time of the Mexican Revolution at the beginning of the 20th century. La Calaca Catrina, a skeletal figure dressed up in fancy European garment, was made out of mockery of the criollo elite who identified themselves more with the royalty of Europe than the Mexican peasantry. Today, Catrina is the symbol par excellence of Day of the Dead throughout the world. Nothing like some good bread. Right? Well, pan de muerto or bread of the deceased is a special sweet treat baked up each year come Day of the Dead. What’s notable about this bread is its shape. Pan de muerto is round, representing the cycle of life and death. The circular part on the top of the bread is the skull; the long extensions reaching out from the top to the bottom represent bones which are also arranged to symbolize the four Cardinal directions of the universe known as Nahuolli by the ancient Aztecs. As an added bonus: it’s delicious and goes great with a cup of Mexican hot chocolate. If you’re able to make it to Cozumel or the Riviera Maya for Day of the Dead, be prepared for a sensorial experience like no other. The sights, sounds, aromas, food, and, of course, flowers. Marigold flowers. Tons of them. Big, beautiful, and bright orange. They are strewn out over the paths that the deceased should follow to reach the altar erected in their honor. 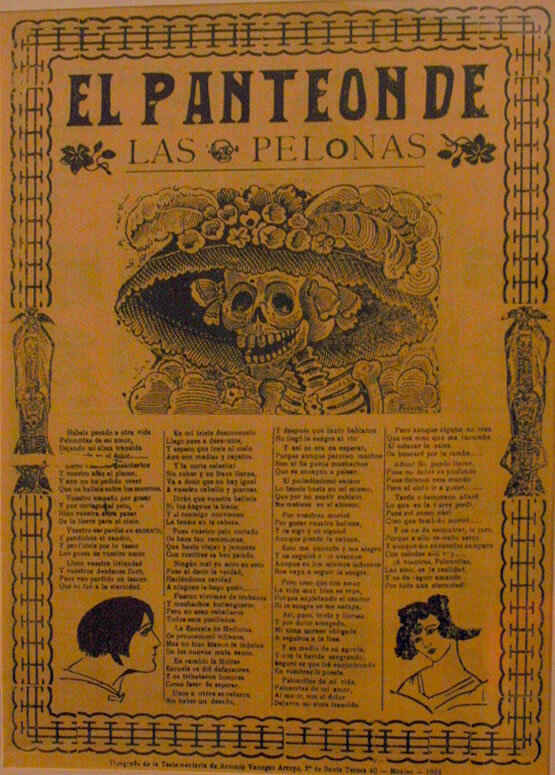 Last, but definitely not least, are the calaveritas literarias (Day of the Dead poems). There are two times a year when it’s common to hear public display of laughter and ridicule directed at the country’s ruling class: Carnival and Day of the Dead. Calaveritas are satiric metric verses written in a rhyming scheme which popular each year during Día de los muertos. In general, they speak of the living as if they were deceased, not in a mean but in a fun and sarcastic manner. Of course, everything and everyone is fair game in a Calaverita. There is no way you’ll ever be able to experience all of the fun and spectacular Day of the Dead activities in the Yucatan Peninsula. However, thanks to the dates of some of these events, it will be possible for you to combine one or more of the festivities. At the time of publishing, this list is incomplete. We will continue to update the list as we are informed of more Day of the Dead events. In the meantime, here’s the breakdown by destination. No matter where you are in Mexico during this time of year, you’ll be able to enjoy a special experience. The central plaza of Cozumel will, ehm, come alive from October 31st through November 2nd with a fun-filled cultural program celebrating Day of the Dead. Finally, from October 30 through November 2, El Pueblo del Maiz is organizing the festival “Because Life is Born of Death” each evening from 6:00 p.m. to 9:00 p.m. Activities include an interactive tour, workshops, and samples of typical Day of the Dead dishes. The cost is $500 pesos for adults and $350 pesos for children. There will be several major events to celebrate Día de los muertos in the Riviera Maya. The Xcaret Park tribute to Day of the Dead known as the Festival of Life & Death is the biggest and most well-established event during this time of year in the Riviera Maya. As with everything the people at Xcaret get their hands on, this festival is aesthetically-pleasing to the extreme, well-operated, and tons of fun. The only but, which for me personally is a major one, is the fact that the festival has outgrown its size and the crowds are unbearable getting in and out as well as walking around the park. If that doesn’t turn you off like it does me, however, this one is well worth it. Held each year from October 30th through November 2nd, the 2017 Festival of Life and Death will be Xcaret’s 12th edition. Included in the festivities are interactive workshops, special exhibitions, music, dance, theater, and tons of eye candy. Click on the link to see the entire Xcaret Day of the Dead program. The price of entrance to the Festival of Life and Death ranges from $99 USD to $129 USD for adults and includes entrance to the Xcaret Park. A new tradition in the trendy town of Playa del Carmen began just two years ago and it’s amazing no one thought of it earlier. Yes, fashion-conscious Playa del Carmen is home to a fun-filled parade of stunning Catrinas showing off their strut along the hip strip known as 5th Avenue or Quinta Avenida. Known as “We are all Catrinas,” this year’s parade is sure to be even bigger and better than last year’s edition, which counted with the participation of over 80 different artists from Cancun, Playa del Carmen, and Cozumel. The events will begin on October 27 at 7:00 p.m im the Sayab Planetarium with a ceremonial ribbon cutting and a collective exhibition of Day of the Dead related artwork. The Catrina Parade will be the next day on October 28 beginning at 5:00 p.m. in front of the Quinta Alegría shopping mall. The procession will then head about ten blocks south to the Parque Fundadores (the park close to the Cozumel ferry) and end with theater, music, a costume contest, and a Day of the Dead poem competition. This is another new twist on an ancient tradition. The tour company based out of Playa del Carmen known as Alltournative is also in its third year of organizing a Day of the Dead celebration. However, in adherence with the region’s identity, this one is a tribute to Hanal Pixan. Set in the Mayan village of Tres Reyes, guests gather around the Cenote de la vida (Cenote of Life) for a beautiful candlelit ceremony followed by a traditional dinner including some delicious Hanal Pixan specialties. The event will start in the afternoon of November 2nd and is limited to just 250 guests. Tickets cost $36 USD per person and can be booked on the Alltournative website. Transportation will be provided from Cancun and Playa del Carmen. Spaces are limited and will go fast for this visual and spiritual Day of the Dead treat. We still haven’t received any concrete information on 2017 Day of the Dead events in Cancun. Don’t fret, however, as there will be several great options to choose from which we will duly announce as we get closer to the actual dates. One place where you’ll definitely be able to experience some fun Día de los muertos activities in Cancun will be at Parque Las Palapas. Located in downtown Cancun, this park is a great evening attraction of its own, with live shows, great local fast food known as “guarnachas”, tons of local families and friends taking in the Caribbean night, and of course, a fair share of souvenir stands. From October 31st through November 2nd, you’ll be sure to find altars, sugar skulls, pan de muerto, beautifully-dressed Catrinas, and much, much more at the “Dinner of the Souls” held each evening during the aforementioned dates! No destination in the Yucatan Peninsula does Day of the Dead like Merida. Perhaps it should come as no surprise since this beautiful colonial city has been deemed the American Capital of Culture for two years running. Words really wouldn’t do justice to what you can experience at a Hanal Pixan celebration in Merida. There is a lot to see and do both in the downtown colonial center as well as in the surrounding towns. However, nothing is more spectacular and worth a visit than what is known as the Paseo de las ánimas or Passage of the Souls. Last year, over 50,000 took part in the stunning procession in which participants and onlookers alike dress up in white and paint their faces. Beautiful, upbeat, and mesmerizing. Just like Merida. This year’s Paseo will take place on Thursday, October 27, 2017, and begin at the Ermita Church. Of course, we saved the best for last. Ready for a magical journey by air and land from Cozumel and Playa del Carmen? Our one-of-a-kind Day of the Dead tour departs from Cozumel at 8:00 a.m. and at 8:30 a.m. from Playa del Carmen. We will arrive at Merida International Airport around 9:15 a.m., where you will be picked up by a private transportation service and taken to the Fiesta Americana hotel in downtown Merida. Following check-in and a light breakfast, we will go on a nice scenic walking tour around downtown Merida with some great local tour guides. Then, we’ll head back to the hotel for some rest and relaxation before making our way to Merida cemetery for the start of this spectacular cultural display in tribute to the deceased. Afterward, we’ll participate in the Passage of Souls parade before heading back to the hotel for a night’s rest. Following breakfast at the hotel the next morning, we’ll set out a 9:00 a.m. for a guided tour of the stunning Mayan ruins of Uxmal. Once we’ve toured the ruins, we’ll head off to a stunning regional hacienda called San Pedro de Ochil for a delicious lunch buffet of regional cuisine. Then, it’s back up into the heavens about the land of the Maya for our scenic return flight back to Playa del Carmen and Cozumel. 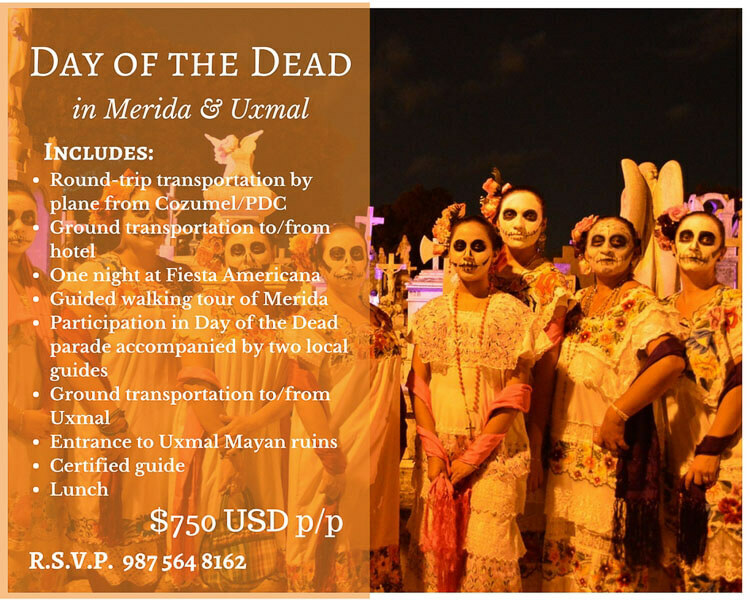 EARLY BIRD SPECIAL: Book your Day of the Dead Package before October 1st and pay just $599 USD! Did we leave anything out? Still have questions? Hit us up in the chat or send us a DM via our social media and we’ll answer A.S.A.P. See you for Day of the Dead! There will be an exhibition on October 27 in the Sayab Planetarium followed by the parade on the 28th starting at the shopping center Quinta Alegria on 5th Avenue and ending at Parque Fundadores (Founders’ Park) which is right by the ferry to Cozumel.